Casa Margarita es una hermosa casa completamente renovada. Esta es nuestra casa cuando en Mérida, así que a diferencia de muchas propiedades de alquiler escasamente equipadas, tiene todas las instalaciones que necesita: gran cocina de cinco fuegos, un montón de ollas y sartenes, tazas y vasos, nevera grande y lavadora, plancha y tabla de planchar. Tenemos habitaciones con baño y una sala tranquila para ver la televisión. La casa está en Santiago, a pocas cuadras de la biblioteca inglesa, dos buenos supermercados, un pequeño supermercado Oxxo a la vuelta de la esquina, una cervecería en la siguiente cuadra y una tienda de asadores de pollo a dos cuadras a lo largo de nuestra calle. El parque Santiago tiene entretenimiento y baile de big band gratis todos los martes por la noche. Tenemos televisión por cable, WiFi, dos bonitas habitaciones con aire acondicionado, una con una cama doble y una individual, una con dos camas individuales, por lo que duerme cinco. Cada habitación tiene baño privado con ducha y grandes terrazas (no son comunes con las propiedades de alquiler), una gran piscina de cinco metros y área de patio, una gran cocina espaciosa que conduce al patio, perfecta para entretener a los huéspedes. Hay ventiladores en cada habitación, y un aseo / lavabo de la planta baja. Hay mosquiteros en todas las puertas y ventanas. Todo el equipo, aire acondicionado en la planta baja y en las habitaciones, nevera, estufa, lavadora, TV, etc. es nuevo para la temporada 2016/2017, y la casa ha sido completamente remodelada para que nuestros huéspedes la disfruten. Todos los equipos e instalaciones que esperaría encontrar en un hogar. Amazing house close to everything in Merida. The house is large and clean. Kitchen had everything we needed. Central to everything, we didn't need a car. Uber is super easy and affordable and the bus and Colectivo get you where you want to go. The pool provided a refreshing cool down on the hot afternoon. Thank you for your kind message and we look forward to seeing you in Merida again! "Plenty of room outside house for parking"
Gracias Nancy! Si hay 'parking' en la calle, y es explicado como ariba. Nosotros son muy feliz con su 'review' y gracias por tu recomendacion. We are a family of three and this house had more space than we even needed. The backyard pool was private and lovely. It makes a huge difference to us to stay in a place with a fully-equipped kitchen and washing machine, so that we can spend our vacation money on special meals and activities. The property manager, Carlos, is helpful, knowledgeable, and a kind person. Our kid loved seeing geckos, butterflies, and the occasional iguana right outside. Apart from the mosquitoes and heat (we traveled in the middle of summer), we had an easy and lovely stay. Thank you to the owners for all the information provided in the home, and to Carlos for the welcome and assistance. Plenty to do and see in the center of Merida as well as the surrounding area. Our kid loved trips to Progresso for a calm beach. Thanks! We stay in Casa Margarita ourselves for some of the year, so we have equiped the kitchen and house with everything you would expect in a live-in home. Comfort is the key! Our first trip to Merida, in fact our first trip to Mexico - how lucky were we then to find Casa Margarita? The house on Calle 49 in Santiago, Centro is in walking distance of downtown areas, the museums, cantinas, shops and the Squares. If you are feeling particularly lazy, then buses drive past regularly on Calle 49 and Calle 47 and a journey costs a mere 8 pesos. Casa Margarita is ideally situated with supermarkets close by, an Oxo and beer shop around the corner and a fruit and veg shops plus a bakery at the end of the street. The house is spacious , spotless and well equipped. It is tastefully decorated, with two large, en suite, double bedrooms, each with it's own patio. The pool area is surrounded by banana plants, bougainvillea and frangipani. It is frequented by birds and the odd gecko and is a welcome retreat after sightseeing. 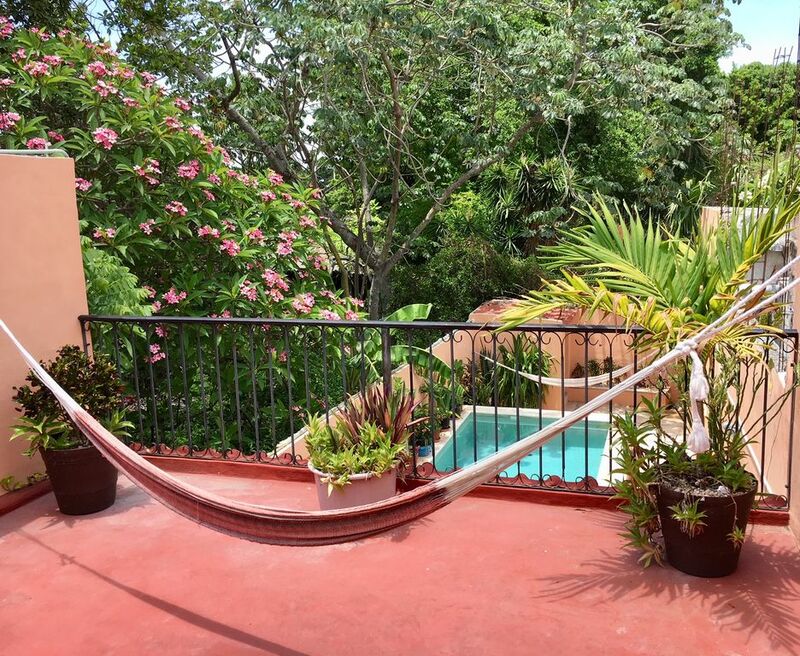 I highly recommend Casa Margarita and hope to return as I never did get to try out the hammocks! Casa Margarita, a home away from home only better. This place is amazing! simple yet stunning, with great artwork on the walls and scenery to match. Great location with only a 5 minute walk to the first square and plenty of shops. Having a pool in the backyard means you can stay cool whenever you need to. It's lovely sitting on the balconies and reading or taking a nap. It's easy to grab a bus to anywhere you would need in town or for getting to the beach 20 minutes away. The people are always extremely friendly. Will try and come back every year if I can. Casa Margarita is a beautiful house in a beautiful location in a beautiful part of the region. Can't recommend it enough. Thank you for your kind words. We would love to have you back at any time! So pleased with Casa Margarita! Loved Merida! I stayed in Casa Margarita with my husband and daughter and it was perfect for us. The kitchen was really well equipped with more than everything we needed, so we were cooking up a storm each evening before heading out to local bars for some drinks. The bars were happy to accept our little daughter so that was nice. I loved having our own pool, and the outside shower was a nice touch. The pool man would come to clean the pool and check the readings once a week too. Great location - there are two large supermarkets quite close, and an OXO 1 minutes walk away, as well as a bunch of small corner shops, and an amazing fruit and veg shop at the end of the road. We bought freshly squeezed orange and grapefruit juice there each morning, and fresh bread at the bakery opposite. We had some friends come and stay and they had their own room with en-suite and private balcony so they were pleased too. All in all, I can't recommend casa Margarita enough, we'll definitely be back! Many thanks for your review --- we love to have happy guests! See you again soon! Cerca de la plaza de Santiago cuenta con actuaciones de música de las grandes bandas libres famosas en martes por la noche con baile, ferias, cafés y mercados temporales que ofrecen alimentos especiales Yucatán y artesanías locales. Encontrará una cafetería, una biblioteca en inglés, dos supermercados (Aki), un pequeño supermercado Oxxo, una cervecería fría, una tienda de frutas y verduras, una panadería, una farmacia y un cine a pocas cuadras de distancia. El distrito de Santiago se encuentra al norte de Plaza Grande, a cinco minutos a pie de Casa Margarita. All utilities are free of charge, except for electricity, which depends on your air conditioning usage. A deposit of USD $50 per week, USD $150 per month is required when you arrive for security and metered electricity usage. The deposit is returned to you at the end of the stay with usage deducted. This is standard practice in Merida. To give you an idea, normal electricity use without airconditioning is around USD $50 a month.